L is getting so big and he is very smart!!! He is now 16 months old and into everything. 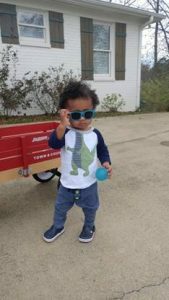 He has been walking since he was 9 months, he is learning all of his animal sounds and body parts, and he is also learning the names of all the grandparents, cousins, aunts/uncles, etc.